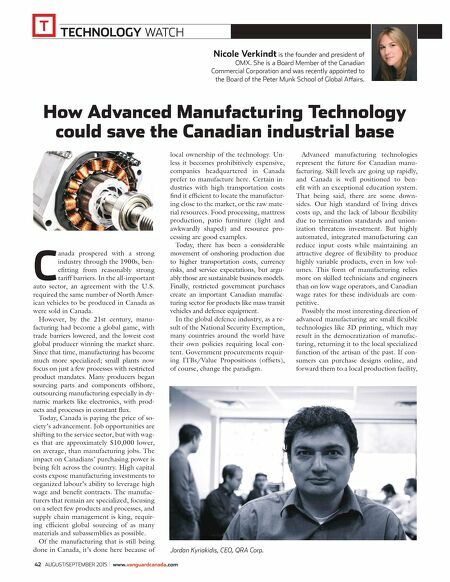 T TECHNOLOGY WATCH 42 AUGUST/SEPTEMBER 2015 www.vanguardcanada.com How Advanced Manufacturing Technology could save the Canadian industrial base C anada prospered with a strong industry through the 1900s, ben- efitting from reasonably strong tariff barriers. In the all-important auto sector, an agreement with the U.S. required the same number of North Amer- ican vehicles to be produced in Canada as were sold in Canada. However, by the 21st century, manu- facturing had become a global game, with trade barriers lowered, and the lowest cost global producer winning the market share. Since that time, manufacturing has become much more specialized; small plants now focus on just a few processes with restricted product mandates. Many producers began sourcing parts and components offshore, outsourcing manufacturing especially in dy- namic markets like electronics, with prod- ucts and processes in constant flux. Today, Canada is paying the price of so- ciety's advancement. Job opportunities are shifting to the service sector, but with wag- es that are approximately $10,000 lower, on average, than manufacturing jobs. The impact on Canadians' purchasing power is being felt across the country. High capital costs expose manufacturing investments to organized labour's ability to leverage high wage and benefit contracts. The manufac- turers that remain are specialized, focusing on a select few products and processes, and supply chain management is king, requir- ing efficient global sourcing of as many materials and subassemblies as possible. Of the manufacturing that is still being done in Canada, it's done here because of local ownership of the technology. Un- less it becomes prohibitively expensive, companies headquartered in Canada prefer to manufacture here. Certain in- dustries with high transportation costs find it efficient to locate the manufactur- ing close to the market, or the raw mate- rial resources. Food processing, mattress production, patio furniture (light and awkwardly shaped) and resource pro- cessing are good examples. Today, there has been a considerable movement of onshoring production due to higher transportation costs, currency risks, and service expectations, but argu- ably those are sustainable business models. Finally, restricted government purchases create an important Canadian manufac- turing sector for products like mass transit vehicles and defence equipment. In the global defence industry, as a re- sult of the National Security Exemption, many countries around the world have their own policies requiring local con- tent. Government procurements requir- ing ITBs/Value Propositions (offsets), of course, change the paradigm. Nicole Verkindt is the founder and president of OMX. She is a Board Member of the Canadian Commercial Corporation and was recently appointed to the Board of the Peter Munk School of Global Aairs. Advanced manufacturing technologies represent the future for Canadian manu- facturing. Skill levels are going up rapidly, and Canada is well positioned to ben- efit with an exceptional education system. That being said, there are some down- sides. Our high standard of living drives costs up, and the lack of labour flexibility due to termination standards and union- ization threatens investment. But highly automated, integrated manufacturing can reduce input costs while maintaining an attractive degree of flexibility to produce highly variable products, even in low vol- umes. This form of manufacturing relies more on skilled technicians and engineers than on low wage operators, and Canadian wage rates for these individuals are com- petitive. Possibly the most interesting direction of advanced manufacturing are small flexible technologies like 3D printing, which may result in the democratization of manufac- turing, returning it to the local specialized function of the artisan of the past. If con- sumers can purchase designs online, and forward them to a local production facility, Jordan Kyriakidis, CEO, QRA Corp.